I don’t know what it is about books written in letter form but I love them! Actually, I take that back. I do know why I love them. Reading them feels like you’re spying on someone else’s life. And honestly, I’m kind of a nosey person; so I like the opportunity to be a bit of a snoop without actually digging in to someone’s personal letters. In books written in letter form I also feel a strong connection to the narrator, the person writing the letter. Gemma is the narrator of Stolen. She is kidnapped from a Bangkok airport and taken to a remote house in the Australian desert. This novel is her letter to her captor, Ty. The majority of the letter is Gemma’s conflicting feelings about Ty. At first she hates him. He stole her from her family and forced her to live in a completely new and dangerous place. I love that Gemma was feisty and constantly looking for a way to escape. It was also interesting to see how her opinion of Ty changes as she gets to know him. The thing that stood out to me the most in Stolen was the vivid descriptions of the Australian desert. Christopher has a way with words because as I was reading I could feel the sun beating down on me. I read this book in December, in South Dakota. It was impressive that she could transport me so fully to this place. I also love the way the story dealt with Stockholm Syndrome. It doesn’t happen all at once. It was a very gradual softening toward Ty, that lad to sympathy. Ty was a sympathetic character even though he shouldn’t have been. He stole Gemma and yet even at the end of the story you can’t help but feel sorry for the guy. Stolen is a wonderful book. The plot is engrossing, and heartbreaking. It leaves you feeling confused on your own feelings about Ty and the entire situation. It also gave me a new understanding of Stockholm Syndrome. 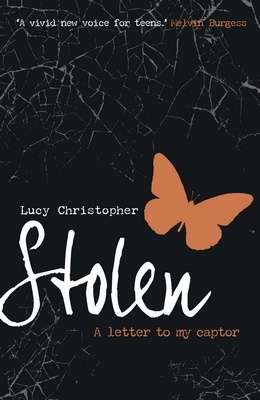 Stolen is my first Lucy Christopher novel but it will definitely not be my last! We are considering this book for our book club. Good to see that you love d it. This one's definitely on my list. And just so you don't feel like you're alone in being nosy - I've been obsessed with letters and journals for as long as I can remember. I definitely have a voyeuristic nature. I don't look in people's medicine cabinets or anything, but if I'm honest, I do *want* to! I loved this book too! The descriptions were so vivid. And the exploration of Stockholm Syndrome was really interesting. I'd never read a book about it before, and I was really excited to finally be exposed to the love affair with one's kidnapper. I'm currently reading The Killing Woods also my Lucy Christopher and I have to admit that the descriptions are amazing, but it's kind of slow xD Just thought I'd put that in here!